1. a) Define hyperbole and understatement. 2. Editorial cartoonists often use humor to make light of an event or action that aggravates them. One of the types of humor they use is irony. Irony is defined when the opposite of what you expect to happen occurs. Describe the irony in Tom Stiglich’s cartoon. 3. 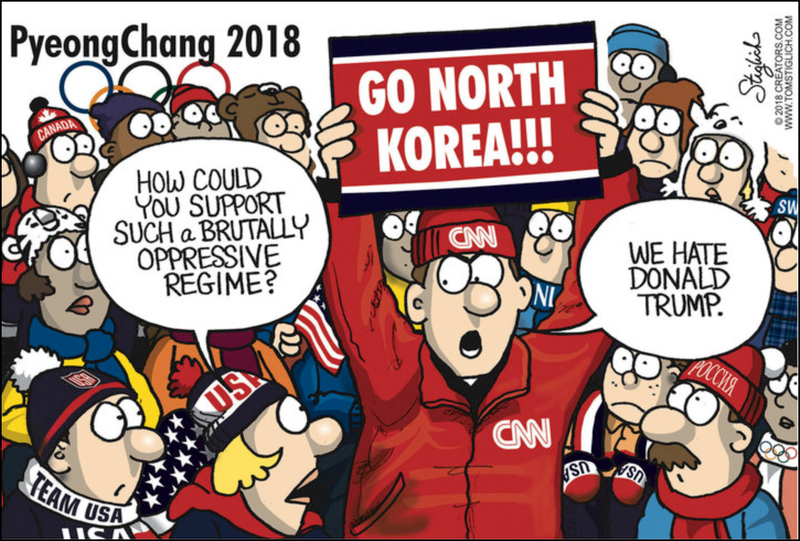 Do you agree with the cartoonist’s assertion about CNN? Explain your answer. Kim Yo-Jong is not a powerless dignitary or mere figurehead family member in North Korea. She is the director of the Propaganda and Agitation Department of the Worker’s Party of Korea, where she helps oversee the brainwashing and psychological terror apparatus of the North Korean state. The rush to praise the “diplomacy” of a woman whose country currently holds around 100,000 political prisoners in multi-generational concentration camps is malicious stupidity. I can’t decide if the story here is that if you look good, that’s all that matters, or that some pundits have such disdain for Pence that they’d favor a family that starves and suppresses their own people over him.